The whole point of a democracy is that Government and its policy direction is determined by the voters. It is a risky business going to the country before you need to, riskier still if you try to fight an election on a single issue. History is littered with failures of judgement in this regard, whether it is Asquith losing his majority over the course of 1910 on the issue of whether the House of Lords could veto the 'People's budget', or Ted Heath in 1974 on 'who governs Britain?' It turned out that it wasn't him. Asquith's gamble turned out better for the country in the long-run than Ted Heath's. Most people consider Theresa May's ham-fisted attempt to turn a modest majority into a thumping one earlier this year to be a personal failure for which she needs to shoulder complete responsibility. She went to the country demanding that they help her overcome the sensible wing of her party, who want to defend Britain's best interest in Brexit negotiations. The country, which is divided roughly 50-50 on this matter, returned a House of Commons that reflected their own indecision. As a result May was left up a dead-end European creek without a paddle. But no, according to one Tory grandee, it was all our fault. In the Independent William Hague is quoted as blaming the British public for making "a mistake" at the general election, by failing to return a Conservative majority and weakening the country’s hands in the Brexit negotiations with the EU. Lord Hague is a historian of course, so he will understand the purport of what he is alleging. Perhaps he needs to step back and put the events of the last decade into context. David Cameron won the Tory leadership on the back of a Eurosceptic manifesto. He was then foiled by the Liberal Democrats from throwing the UK off a cliff edge through implementing his promised referendum. Once he got his hands on the levers of power without that restraining force in 2015, Cameron went ahead and delivered a referendum, which had more to do with keeping his party together than serving the country's best interests. Once lost, he resigned and passed the baton to Theresa May, who clearly did not have a clue how to proceed. Nor did any of her colleagues. However, on the basis of pure opportunism she decided to take advantage of good poll data and go to the country in the hope of her securing a freer hand in negotiations. Alas that back-fired on her too. If William Hague is looking for anybody to blame he should look no further than his own party's leadership. Unfortunately, it is the country that is going to suffer the most for their ineptitude. Those who believe that MPs might have better things to do than hold a vigil for the chimes of Big Ben, may be heartened to learn that the obsession with the clock tower is not unique to our era. I am currently coming to the end of Roy Jenkins' extremely erudite 631 page account of the life of William Gladstone. 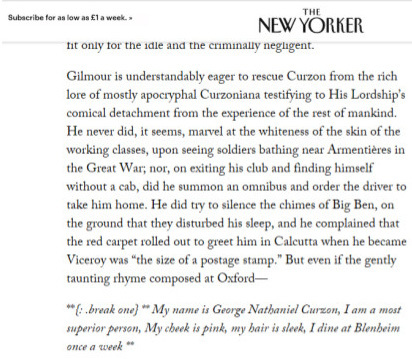 In my reading I came upon a rather intriguing footnote. 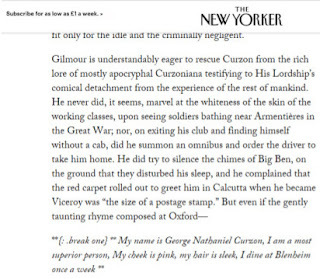 Some research on Google soon confirmed, as seen in this extract from the New Yorker that Lord Curzon once requested that the chimes of Big Ben should be silenced at night so as not to disturb his sleep in the nearby Carlton Club. Parliamentarians had far more class in those days. The Independent reports that UK Government Ministers have spent almost £40m in an “appalling” attempt to stop sick and disabled people receiving the financial help they are entitled to. They say that the hit to the public purse could also be far higher than the new data suggests because it is still unclear how much more the state spends running courts where sanctions are challenged. Despite this huge expenditure the vast majority of appeals were lost by the Government last year. The paper adds that early indications show the problem is becoming even worse in 2017, with a 77 per cent rise in money spent trying to stop people from getting Employment and Support Allowance (ESA) payments. Further data obtained by The Independent under Freedom of Information law shows the Government then spent a further £17m fighting cases in the courts that were not settled at the initial appeal stage, bringing the total appeals process cost to £39m last year. This money could be saved if the Government insisted that all those carrying out work capability assessments were fully qualified to do so, if civil servants stopped overruling assessments they do not like so as to meet targets, and if the process itself was made more humane. Reform is badly needed. Community Housing Cymru (CHC), who represent registered social landlords in Wales, has raised legitimate concerns that Brexit could dent plans to build thousands of affordable homes in Wales. They say that uncertainty over the UK-EU relationship could lead to important funding from the European Investment Bank (EIB) to stall. Stuart Ropke, CHC chief executive, said the deal was almost across the line but has now faltered and the uncertainty surrounding Brexit was the reason. He added: "There is no shortage of financial institutions who want to invest in what is a very successful sector but, what the EIB money would have done, those terms that were on offer - particularly the cost of funding - was very attractive. "Those alternatives that are there will not be on such attractive terms - really, the impact of that is that millions of pounds will leave the sector." Loans from the EIB are typically half the commercial rate, resulting in housing associations having more money to invest. The EIB has injected more than £1bn into Wales in the past decade in sectors including social housing, energy, water and transport. Although there may well be other ways to finance this house building, the stalling of talks over this loan is nevertheless a major blow to the housing sector. It is another reason why we need to rethink Brexit. There are two points of interest surrounding yesterday's so-called 'dramatic policy shift' by Labour on Brexit, the first of which is that for all his passion and sincerity, Shadow Brexit Secretary, Keir Starmer is doing all the heavy lifting, whilst his party leader does his best to ignore the issue altogether. Time after time, Jeremy Corbyn has whipped his MPs to vote with the Conservatives against the Single Market and for a hard Brexit. Yesterday the Labour leader was speaking in Scotland and barely acknowledged the issue, if he mentioned it at all. Unless Starmer can take his party leadership with him on this issue, rather than relying on formulaic words, then Labour will remain as conflicted and confused over EU membership as they have been since Corbyn became leader. The second point is more fundamental. A close analysis of the position that Keir Starmer has set out is that, much as he values single market membership and freedom of movement, it stops short of an outright call to stay in the EU or for a confirmatory referendum or Parliamentary vote on the final deal. Labour remain fixated on immigration and freedom of movement, despite the fact that all the evidence shows that this benefits the economy and that without European workers key sectors could grind to a halt. Equally, Starmer is talking only about a transitional period, admittedly of indeterminate length, at the end of which the country will still fall off an economic cliff. This is not a vision for the future, it is a holding position forced on him by his failure to take his colleagues with him. It is spin more than substance, yet another failure of leadership by the official opposition. The Guardian reports that detectives are carrying out an investigation of “scale and significance” into allegations the Conservative party’s use of a call centre in Wales may have broken the law. South Wales police wrote to the Labour MP Wayne David this week explaining that members of its economic crime unit with expertise in investigating electoral integrity and complex and serious fraud were looking into the allegations. The letter, written on behalf of the assistant chief constable, John Drake, and seen by the Guardian, suggested the inquiry into what happened at the call centre, run by Blue Telecoms in Neath, could be protracted. It said: “The investigation is of sufficient scale and significance that South Wales police are unable to offer any specific timescale of events. The Information Commissioner’s Office (ICO) also confirmed it was investigating the call centre. So that is two successive elections in which complaints have led to an inquiry into Tory campaign methods. Has UK Government rhetoric stoked hate crime? t is a well-established statistic that the number of recorded hate crimes rose following the EU referendum, with people from non-UK ethnic backgrounds being abused in public. Now, a report by a cross-party group of MPs has accused the Government of fuelling “toxic” anti-immigrant feeling though its unachievable targets and general rhetoric on immigration. The Independent reports that the inquiry from a cross-party group of politicians said Theresa May’s discredited target of cutting net migration to under 100,000 was particularly to blame for “stoking anxiety” that has accompanied unprecedented hate crime following the Brexit vote. In their report, Integration Not Demonisation, the politicians were damning about the Government’s controversial target to bring annual net migration down to tens of thousands. They said: “By setting targets for the reduction of immigration which were never achievable and which they inevitably went on to miss repeatedly, ministers undermined public confidence in the ability of the Government to manage immigration. Calling on fellow politicians to tone down their language, the group warned that rhetoric used during the EU referendum led some people to feel “they could act on racist attitudes which had previously gone unexpressed”. The All-Party Parliamentary Group on Social Integration pointed to a marked increase in incidents of racist abuse directed at migrants and an unprecedented spike in racially or religiously aggravated hate crime in the months following the Brexit vote. They called for a major drive to integrate immigrants, warning that they increasingly lead “parallel lives” in Britain and proposed compulsory English classes for newly arrived migrants who cannot speak it, funded by loans to be repaid once they reach a salary threshold like student loans. The demonization of immigrants and the openly racist language of some Brexiteers, particularly in UKIP, during the referendum campaign has undermined good community relations and led to an increase in racist violence and abuse. That cannot be allowed to continue. The Government must tone down its own rhetoric and policies to help to repair the damage they have done. When Donald Trump won the Presidency the thoughts of many of us turned to what would happen when he took possession of the nuclear codes. His erratic and thin-skinned behaviour over the last seven months has heightened rather than eased that anxiety. James Clapper, director of national intelligence (DNI) for seven years under Barack Obama, questioned the US president’s “fitness to be in this office” after his demagogic performance in Phoenix, and expressed anxiety about Trump’s power to launch nuclear weapons without consulting Congress or any other official. Once a president has verified his identity with a code kept constantly on his person or nearby, the military chain of command has no power to block his launch orders. “Having some understanding of the levers that a president can exercise, I worry about, frankly, the access to the nuclear codes,” Clapper told CNN, pointing to the current stand-off with North Korea. Clapper did not mention Richard Nixon, who was involved in a tense stand-off with North Korea in 1969, after the regime shot down a US spy plane. Nixon is reported to have gotten drunk and ordered a tactical nuclear strike, which was only averted by his national security adviser, Henry Kissinger. Somehow, none of this makes me feel any better. Is Brexit destroying our airports? I have blogged previously on the impact of Brexit on the ability of British airlines to operate freely within Europe. International air travel depends on a host of bilateral treaties, and there is no default fallback for the UK outside the EU. It is unsurprising therefore that UK airports have joined forces to press the government to urgently strike a post-Brexit deal on flights between the UK and the EU, warning that the current uncertainty alone would be enough to see bookings drop by up to 41%. Yet another reason why we need to think again on leaving the EU. Will the switch to electric vehicles cause the UK to blow a fuse? Just how prepared is the UK for the new Government policy of phasing out petrol and diesel cars by 2040? According to this article in the Daily Telegraph, there is still some way to go. The National Grid have expressed concerns that an average size 3.5kW battery charger would take 19 hours to fully charge a car battery, even when it is 25 per cent full. A “thought piece” document obtained by the Financial Times warned that a more powerful 11kW device would still take six hours to charge a car battery and during that time, the use of everyday items such as kettles and ovens would blow the fuse. “The average household is supplied with single phase electricity and is fitted with a main fuse of 60-80 amps,” the National Grid said. The National Grid went on to say that most electric cars will require a battery capacity of 90 kilowatt hours (kWh) to make journeys of around 300 miles. It suggests that the ability to travel longer distances without stopping to recharge will be a “must have” if motorists are to abandon petrol or diesel cars. We await the UK Government investment needed to counter these concerns and to fulfil the vision they have set out. Failure to secure a majority in the House of Commons can often be a valid excuse for not delivering on an election promise, but when there is cross-party support and overwhelming backing for a proposal in the House of Commons, the abandonment of a popular proposal makes no sense whatsoever. That is certainly the case with Theresa May's manifesto pledge to cap energy prices. No sooner had she stepped back over the threshold of Number 10 Downing Street than the idea had been shelved. It is not surprising therefore that she is now facing a significant backlash from rebellious Conservative MPs, who are feeling a little miffed that the 17 million British people who stood to benefit from the cap have been abandoned to the oligopolistic power companies. The Independent says that 53 MPs, including 20 former ministers, have now called on the Prime Minister to fulfil her electoral promise to introduce a cap for all families on a standard variable tariff. The protest, organised by former minister John Penrose, has the backing of 38 Labour and SNP MPs, and includes prominent Conservative figures such as the former Work and Pensions Secretary Iain Duncan Smith. In their letter, which will be delivered to Downing Street following the parliamentary recess, the MPs demand that Ms May extends Ofgem’s proposals to introduce a price cap on bills for 2.5 million vulnerable consumers to all of the 17m originally promised during the election campaign. “While these proposals are a step in the right direction, it is clear we must do more to protect the further 15 million households who continue to be preyed on by the Big Six energy firms,” they add. ”As you can see from our signatures below, the idea has substantial cross-party support. “It was promised in the three leading party manifestos and a temporary, relative price cap has support from most of the 'challenger' energy firms - the insurgents who are challenging the dominance of the Big Six incumbents, and providing choice and stronger competition, which benefits consumers." It is time for Theresa May to keep her promise. When I first got involved in politics the Tories used to claim that they stood for the rule of law. Now, through the machinations of Brexit, it is becoming much clearer that the only law they are interested in is the narrow, paternalistic, inward-looking law of a little Englander. This article in the Observer sums up the inconsistencies and selfishness of Tory thinking, which will leave the UK isolated economically, legally and politically. It is a shame that the so-called Labour opposition is acting to reinforce this sterile viewpoint instead of actively opposing it. The paper says that the former head of the government’s legal services has ridiculed the prime minister’s claim that the UK can break free of all European laws while continuing to reap the economic benefits of the EU’s single market. Sir Paul Jenkins, who was the government’s most senior legal official for eight years until 2014, insists that if the UK wants to retain close links with the single market and customs union it will have no option but to observe EU law “in all but name”. This week more papers will be released, including one spelling out how legal disputes could be resolved between the UK and EU once the European court of justice (ECJ) no longer has direct jurisdiction in the UK. Leaving the ECJ has been one of the totemic aims of Eurosceptics and any government U-turn on the issue would provoke an outcry among Tory Brexiters. May has repeatedly said that the UK will break free of the ECJ and leave its jurisdiction on the day of Brexit. UK and EU legal experts are becoming increasingly vocal in asserting that the prime minister’s policy is unrealistic and impossible to achieve. Jenkins, now employed by barristers Matrix Chambers, said: “If the UK is to be part of something close enough to a customs union or the single market to remove the need for hard borders, it will only work if the rules are identical to the EU’s own internal rules. “Not only must they be the same but there must be consistent policing of those rules. If Theresa May’s red line means we cannot be tied to the ECJ, the Brexit treaty will need to provide a parallel policing system. Open Britain, which campaigns against a hard Brexit, claims that unless the government gives ground, the EU’s Peace programme – which under its fourth round of funding covering the period 2014 to 2020 is set to receive a total of £208m from the European regional development fund – is in jeopardy. The programme, which aims to boost “cohesion between communities involved in the conflict in Northern Ireland” and “economic and social stability”, applies to Northern Ireland and the six border counties of the Republic. And yet it appears that the Tories do not care about this or any other consequence of their hard Brexit policy. Why are mainstream politicians starting to use terrorist attacks to make political points? There was predictable and justifiable outrage yesterday when Plaid Cymru's leader tweeted to suggest that the Barcelona attack was "far right" terrorism. Thirteen people died when a van drove into pedestrians in the Spanish city, with so-called Islamic State (IS) saying it was responsible. However, Leanne Wood suggested that far-right ideologies are driving both IS and white supremacists. His fellow Tory assembly member Janet Finch-Saunders said the comments were "at best poorly timed and ill-judged, at worst cynical and morally depraved". "Politicising terror so fresh after an attack can never be acceptable, and only adds to the hysteria and toxicity of debate. "I am staggered by the reaction to the point that Isis and white supremacism both have far right ideologies driving them. "Both see their group as superior to others. Both see people who are not in their group fair targets for abuse, violence and even death. Both hate minorities and consider women to be less than men. "Both believe in using extreme violence to repress people with different views. This is far right/ fascism ideology. How can it not be?" Less than 24 hours after 14 people were killed in the popular Spanish city by terrorists, Mr Goldsmith’s brother, Ben, commented on a post which suggested one of the men involved in the attack had shared an anti-Semitic video, alleging “a global Jewish conspiracy to take over the world”. The Richmond MP, Mr Goldsmith, then shared his brother’s provocative remarks. Strangely neither the Welsh Tories nor UKIP appear to have responded to these equally inappropriate remarks. What is wrong with these politicians? People have died, their families are grieving, the authorities are still hunting suspects and all they want to talk about are dubious similarities with other groups (some of whom may have been involved in violence elsewhere) who had nothing to do with these attacks. The ruling by a judge in Northern Ireland yesterday, rejecting a challenge to the province's ban on equal marriage, underlines the need for Stormont to catch up with the rest of the UK on this issue. The Guardian reports that Mr Justice O’Hara rejected both cases challenging the ban, insisting it did not violate the rights of LGBT couples. He said it was up to the Stormont assembly to decide social policy in Northern Ireland. The two couples brought the case against the department of finance, which regulates Northern Ireland’s marriage laws, on the grounds that the ban contravenes the right to marriage and respect for family life under the European convention on human rights. It is possible that they will now seek to take their case to a higher court, but wouldn't it be much easier if Northern Ireland's Legislative Assembly pre-empted them by bringing the province up to speed with other parts of the UK? It is time Northern Ireland joined the twenty-first century on social policy. Vince Cable's prediction that there is a 'significant possibility' that Brexit still won't happen is rapidly becoming a reality, in substance if not in name. The UK Government proposals for visa-free travel from the EU, no hard border between Eire and Northern Ireland and tariff-free trade leads one to the inevitable question - why bother at all? However, trying to recreate the rules of a club whilst resigning membership is fraught with problems, not least that the Government needs the consent of the other EU countries to proceed in this direction. And why should they co-operate? If a country can leave the EU but still maintain the same benefits of membership then what is the point of continuing with the EU? Signing up to the UK Government's proposals would be tantamount to dismantling a political and customs union that has helped to keep the peace in Europe for over 50 years. Furthermore, it is unclear whether the UK Government's plans fit in with World Trade Organisation rules. As I understand it you cannot apply different rules to different countries. Being in the EU created a single customs entity which was allowable. Once we have left we in a whole different ball game. Although the weaker pound, leading to higher food prices is a direct consequence of the vote to leave, the actual ramifications of leaving the single market will not start to become apparent until the deed is done. It is bizarre therefore that UK Government studies examining the impact of Brexit are being hidden from the public. What are they trying to hide? The Independent reports that more than 50 studies into the impact of Brexit are being kept secret for fear they could cause embarrassment to ministers. They say that Brexit minister David Jones has confirmed in a letter that the Department for Exiting the European Union had “conducted analysis of over 50 sectors of the economy”. But ministers are so far resisting calls to publish the findings of the investigations in full, arguing that some findings “would undermine the Government’s ability to negotiate the best deal for Britain” were they made public. A hint at how disastrous the predictions contained in these documents could be was contained in one leaked piece of research by the Department of Health, which found that Brexit could cause a shortage of more than 40,000 nurses by 2026. It seems that the Government is trying to hide the true consequences of their hard Brexit policy from the public for fear that they will be forced to change tack. A change from Brexit, Brexit. Brexit today, to my favourite subject of cats. The Evening Standard reports that Parliament has racked up a £130,000 pest control bill in a bid to rid the Palace of Westminster of mice and moths disturbed by building work. The paper says that payments to control the infestation soared to almost a third higher than last year’s bill, with the majority of the costs covering the employment of a full time pest controller and setting more than 1,700 traps. Some believe that the Parliamentary estate is overrun with vermin, and they don't mean the politicians. The newspaper adds that some 411 mouse sightings were reported between January and June compared to just 313 the previous year. £8,900 was spent on catching moths and £16,000 spent on a hawk to control pigeons. Apparently, all the maintenance work on the estate has been disturbing the pests and sending them scurrying for new refuges. 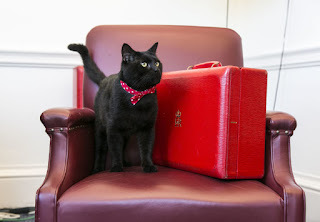 Some MPs have brought in their own cats to help deal with the problem. Many believe that the Parliamentary authorities should follow suit and introduce an army of cat mercenaries to sort out the unwanted intruders once and for all. Larry, Palmerston and Gladstone would approve. How badly will a hard Brexit split the Tories? Dissension is starting to stir about Theresa May's approach to Brexit in the Tory Party but it is not yet clear to what extent it will divide the Tory Party as it has done in the past. At least one former Minister has indicated her willingness to quit if the final deal is not to her liking or in the Country's best interests. Soubry, who has become the most vocal pro-European among Tory MPs, has never before been quite this explicit about how Brexit could lead to her quitting the party. However, in her article in the Mail on Sunday, she was careful to avoid saying what would constitute the “hard Brexit” that she says she cannot accept. The term “soft Brexit” was used to describe Britain staying in the single market or the customs unions, options that the government has now very firmly rejected. The government wants the UK to instead have a free trade deal with the EU, an outcome that many would describe as a “hard Brexit”, although not the hardest Brexit of all, which would involve leaving with no deal at all. Soubry went on: “But if the prime minister or her successor (in the event of Theresa standing down) is not prepared to confront the ideologues, I gravely fear that the party could split – and that would change Britain’s political landscape completely. “Many remainers like me have been true to our promise to respect the result of last year’s referendum. The dissenters are certainly starting to speak out. I listened with mounting incredulity yesterday morning as UKIP's Welsh MEP, Nathan Gill told Radio Wales listeners that if anti-Islam campaigner, Anne Marie Waters was elected as leader of his party then he will quit UKIP altogether. Nathan Gill is also a Welsh Assembly Member, an institution in which he sits as an Independent following his ousting as Welsh Leader by former Tory Minister, Neil Hamilton. He has a distinctly independent and stubborn streak, which is to his credit, as is his stand against extremism and racism. The North Wales AM called Streatham MP Chuka Umunna a "coconut" in a recorded call in May 2016 to her then senior adviser Nigel Williams. She later apologised. Mr Gill claimed the issue, which the party postponed making a decision on at its National Executive Meeting, had been "kicked into the long grass". "I have said very clearly that I think that Michelle Brown should be expelled from the party," he said. "We have to show, very clearly, what we are not - and we are not a racist party and I fought so strongly for that." It is possibly a bit late for that. However, the question has to be asked of Mr Gill, if he finds it so unacceptable to be a member of UKIP led by Anne Marie Waters, how can he remain in a party which allows her to remain a member and stand for leader in the first place? I am sure that David Miliband will not see it this way, but his 'impassioned call for politicians from all parties to work together to avoid the Tory high command driving the country “off a cliff”', is precisely what the Liberal Democrats have been saying for over a year. According to the Guardian, the former Foreign Secretary and Labour leadership contender, has warned that Brexit is an “unparalleled act of economic self-harm”. The paper says that he suggests that it is up to MPs of all political colours to fight back against its worst consequences. Crucially, he argues that the country’s future should be decided by another vote on the terms of a final settlement – either by referendum or in parliament. The Liberal Democrats of course, have been arguing for a confirmatory referendum, but given the advisory nature of the first plebiscite, if Parliament were to reject any deal and opt to stay within the EU that would be a satisfactory outcome, taken in the national interest. I don't believe that there is a need for a new party to promote this view. We already have an established party with grassroots organisation and a large membership who can put the commonsense case in Parliament and to the country. Setting up a single issue party in such a short period of time, dependent on Parliamentary defections (chiefly from the Tories), and without any democratic legitimacy or organisation could quickly backfire. It would help though if the Labour Party took up David Miliband's call to arms and joined us in opposing the Tories instead of working so closely with them on putting in place a hard Brexit. Could the UK end up in court over the single market? There is an interesting article in today's Independent which once more exposes the lies fed to us by the Brexiteers during the referendum campaign and since. Legal experts, including one who advised the Treasury, agree Theresa May will leave the UK open to legal action in The Hague if she pulls out of the European Economic Area (EEA) without formally telling its other members 12 months in advance, to avoid disrupting their trade. The notice is demanded by an international agreement, but ministers do not intend to follow the process because, insiders believe, they want to avoid a Commons vote on staying in the EEA – and, therefore, the single market – that they might lose. As well as the a court battle, experts warn the stigma from breaking the agreement could also make it harder for Britain to secure the trade deals it desperately needs to secure the economy after Brexit. Pro-EU MPs hope the legal opinion will help persuade the Commons to force and win the vote on staying in the EEA planned for the autumn. Yet another mess that this incompetent government is leading us into. Could Brexit lead to a brain drain that will decimate UK scientific research? A Brexit survey run in March by Nature found that of the 907 UK researchers who were polled, around 83 percent believed the UK should remain in the EU. Paul Drayson, former minister of science in the Department for Business, told Scientific American: “The very idea that a country would voluntarily withdraw from Europe seems anathema to scientists.” In Geim’s case, he and most of his engineers are not British by birth. Indian and Chinese nationalities dominate, followed by Russians, Ukrainians, Italians, Spanish and Polish. All of his funding comes from the EU. The Brexit result has cast thick doubt about how money and people will flow to and from the UK. That long and storied tradition which, from Newton to Hunter, from Turing to Crick, has enabled the UK to put its name to a multitude of world-altering discoveries. Sticklers will argue that Newton’s discovery of gravity, or Turing’s foundational work in computing happened without EU subsidy. But none could seriously contest that British scientists have flourished within the framework the EU has created for collaborative science, and the structures it has provided to facilitate that enterprise. Brexit will make us poorer in more way than one. The Independent reports that Ministers have been accused of wasting taxpayers’ cash in a legal fight to “suppress” the results of fitness-to-work tests, to protect the “commercial interests” of private firms. They say that the Information Commissioner ordered the release of the information about controversial Work Capability Assessments (WCAs), which have been repeatedly attacked as cruel and unfair:. It would reveal the monthly performance details from each testing centre used to decide if people are sick or disabled enough to receive benefits. But the Department for Work and Pensions (DWP) is now appealing the watchdog’s ruling to a legal tribunal, dragging out the case until at least November. The paper says that MPs have protested about people with serious health conditions – including cancer patients awaiting operations and a stroke victim in hospital – being judged fit-to-work and being stripped of benefits. However, the DWP is bizarrely insisting the information – dating all the way back to 2011 - must be kept under wraps “as it covers commercial interests”. They must not be allowed to get away with this. Democratic accountability should mean that this information is made public. Nobody can govern in isolation. Ministers need to engage with the outside world to help attract trade, to build contacts and influence with other governments and bodies so as to secure benefits which we can all enjoy, and of course, to learn from the work of others to improve public services. I have no problem therefore with this piece on Walesonline, which details the £150,000 spent by Welsh Ministers travelling around the World last year. In my view, if the £30,936 spent by the First Minister, a private secretary, special advisor and press officer to go to Washington DC and New York in February this year can help to bring trade and jobs to Wales then it is money well-spent. Equally, the £15,671 spent by the Environment Minister seems perfectly in order. She travelled to Brussels, Luxembourg, Paris, Marrakesh and Dubai. Two of those trips were to the Agri-Fish Council. One, in Luxembourg taken with a policy official cost £1,567. The other, to Brussels two months later, cost £1,696. She travelled to Dubai to promote Wales’ thriving food and drink industry, during which she joined 25 Welsh food and drink producers at Gulfood, the world’s largest food trade event. The big question marks however, have to be the various Ministerial trips to back Wales in the Euro finals. Did Wales' performance in beating Slovakia really benefit from having a minister spend £1,775 to travel to Bordeaux to see the game? Did the governance of Wales benefit from that trip? The racist and misleading campaign by Brexiteers may well have been enough to win the referendum in June 2016 but it has come apart at the seams ever since. In particular the much-mocked and untrue claim on the side of a bus that leaving the EU would lead to an extra £350m a week to invest in the NHS was debunked fairly quickly. None of the UK Ministers who made that pledge are prepared to deliver on their promise, which begs the question as to why they continue to promote the leave agenda? The Independent has now published figures which highlight what nonsense that claim was. They say that Britain is paying the European Union less than half the sum claimed by Brexit campaigners. The UK’s net contribution has fallen to its lowest level for five years, at just £8.1bn in 2016-17 – or about £156m a week. Furthermore, the £8.1bn sum for the annual bill would fall further if the Treasury figures included payments from Brussels into private-sector organisations in the UK. The Horizon 2020 scientific research programme and funding for education, training, youth and sport through the Erasmus+ scheme together receive about £1.5bn annually. It is time for an apology from Boris Johnson, Michael Gove and their cronies. The irony has not escaped me that a new law being proposed by the UK Government to give people sweeping new powers to see what tech companies know about them and have it deleted is being brought in to mirror provisions already in existence in EU law. As ever the UK Government relies on the EU for its more liberal legislation. The Independent says that the Data Protection Bill will make it far more easy for people to find out how companies are using their personal details, including their browsing history and even their DNA. And once they've seen it, it will also greatly increase the "right to be forgotten" – allowing people to make those companies delete that most personal of information. As well as giving people far more power in how their information is handled, it will also make companies be more up front about how it is collected. Companies won't be able to trick their customers by using pre-selected tick boxes that opt into tracking, for instance, and people will instead have to give their explicit consent. Enable parents and guardians to give consent for their child's data to be used. The legislation will bring the European Union's General Data Protection Regulation (GDPR) into domestic law, helping Britain prepare for Brexit because it will mean the systems are aligned when the UK leaves the bloc. The Information Commissioner's Office will be given significantly tougher powers, with the maximum fine it can levy being increased from £0.5m to £17 million, or 4% of a firm's global turnover. We will need to see the details once the bill is published but in principle it seems like an important step forward. There are many contradictions and inconsistencies in the commitment by the Conservative Government and their Labour hard Brexit allies to abandon all of our links with Europe so one more should not make a difference. However, when that contradiction comes about after the policy is determined and because Ministers have not properly thought-through the consequences of their decisions, then there is no excuse. In this particular instance I am referencing the announcement that the UK will ban the sale of petrol and diesel cars by 2040, and redouble its efforts to promote the uptake of electric vehicles. The Independent reports that although this will help us reduce our CO2 emissions, a huge proportion of which come from transport, and support the roll out of new technologies, the electrification of our transport over the next decades will place enormous stresses and strains on our electricity infrastructure. In the past, we would have met this demand by building cheap coal power stations, but this would defeat the point of low-emissions vehicles. Instead, and as the paper points out, we will need to meet this huge increase in electricity demand with a range of low-carbon technologies: wind-power, solar, tidal, batteries and crucially nuclear power. They say that nuclear has provided about 20 per cent of the UK’s electricity supply for several decades, and it has done so reliably and without producing any CO2 emissions. National Grid have estimated that electric vehicles could create as much as 18 gigawatts of extra demand for electricity, equivalent to six Hinkley Point power stations. Yet power stations in the planning stage are just going to replace those which have reached the end of their useful life. There is going to be a massive shortfall in capacity. So why are we leaving Euratom? Euratom ensures we can access the nuclear materials that we need to power our existing, and future, nuclear power stations. It ensures all the proper safeguards and inspections take place in a way that is consistent with international rules and regulations. We may be able to replicate it, but that work will be costly and could take a minimum of five years, leaving us in limbo. A lot of work and effort will be undertaken to replace the benefits of Euratom and at the end of it we will just be back where we started. If we leave Euratom without the necessary arrangements in place, then we will be unable to import the material to power our nuclear power stations. Our scientific collaboration will be hindered, and funding may dry up. The Government has been clear about the need to decarbonise our electricity supply and that our transport should be powered by ever-greener electricity. This requires investment, policy certainty and a pragmatic and sensible approach to how we shape our energy policy. Our decision to leave Euratom delivers none of these things. It is short-sighted, counter-productive and dangerous. That is why there is not a single advocate for our leaving Euratom – other than the Government’s lawyers. Leaving Euratom without a viable alternative will only worsen our security of supply position, which is already challenging. Rapid roll-out of electric vehicles over the next decade and beyond will further worsen this situation if we don’t have the policies and investment in place to meet demand, and the Government risks creating a major challenge to delivering reliable, affordable and low-carbon energy. This is one contradiction that is avoidable if only Ministers think about their new policies before announcing them. The price that Wales will pay for voting out? When Wales voted to leave the EU many felt that we were biting off our nose to spite our face. After all Wales is a net beneficiary of European funds. The EU is also our biggest market. Now the Western Mail has spelt out exactly what we will lose by leaving. Their research found that every local authority would be negatively affected under either scenario but concluded that the economic impact of leaving the single market and customs union would be around twice as severe as a milder Brexit. The academics said they were surprised that the additional cost of a hard Brexit was significantly higher in some areas than others – and cited the nature of industry and employment in those areas as the reason. Across the UK, the worst affected authority by a hard Brexit would be the City of London which they estimated would lose around 4.3% of its Gross Value Added (GVA) - a measure of economic activity. Areas that were most likely to vote remain are those that are predicted to be worst hit by either form of Brexit all across the UK. In Wales, Cardiff would be the worst affected authority by either form of Brexit and would face a 1.3% hit by a soft Brexit or a 2.5% hit from a hard Brexit. That is equivalent to stripping £117.21m out of the economy or £225.40m in the hard Brexit scenario favoured by Prime Minister Theresa May. In total, based on 2015 GVA figures, Wales would take an annual economic hit of £627m from a soft Brexit or £1.1bn from a hard Brexit. My own local authority area of Swansea could lose £49.53m off it GVA through a soft Brexit and £90.06m if it were a hard Brexit, a fall of 2%. In neighbouring Neath Port Talbot, which voted overwhelmingly to leave, the figures are a loss of £21.42m on a soft Brexit and a loss of £29.99m on a hard Brexit. That is a lot of jobs at stake, underlining once more the case for a referendum on the outcome of negotiations. People have the right to change their mind if what is negotiated does not meet their expectations especially given the lies that were fed to us by the Leave campaign. As a local councillor I deal daily with complaints and issues around refuse collection, recycling, fly-tipping and litter. It seems to me that local councils and government put the emphasis on the consumer and local resident to protect the environment and recycle, without making much effort themselves to reduce the amount of waste in the first place. It is for that reason that I welcome the conclusion of think tank, Green Alliance, reported in the Guardian, that plastic marine litter could be cut significantly if the government adopted a bottle deposit scheme as part of five key actions to tackle pollution of the oceans. They say the single most effective action to reduce plastic pollution in the seas would be a container return scheme along the lines of those run in large parts of Europe, north America and Australia. In such schemes, a small tax is added to recyclable and reusable containers at the point of sale, which consumers can reclaim by returning them. Enforce Operation Clean Sweep – a voluntary industry initiative to reduce pollution from plastic pellets known as nurdles – responsible for 9% of marine plastic pollution. Enforce existing maritime dumping bans. Upgrade wastewater treatment plants with sand filters to catch microplastic fibres from synthetic clothes when they are washed. Expand the ban on microbeads to all products – not just cosmetic rinse-off face washes and other wash-off products. The Guardian revealed new figures last month which show a million plastic bottles are bought every minute across the globe and that production will increase 20% by 2021. Fewer than half of the bottles bought in 2016 were collected for recycling and just 7% of those collected were turned into new bottles. Instead most plastic bottles ended up in landfill or in the ocean. What is the government hiding from us? There will inevitably be a huge number of answers to that question raising from the positively conspiratorial to the mundane. If Ministers and civil servants wish to rise above suspicion, paranoid or otherwise, then they need to buck lifelong instincts and open up their files. The Freedom of Information Act was designed to do precisely that of course, but the Blair Government lost its nerve and threw in so many exceptions and exclusions that the final product was a shadow what was originally intended, even of the US version. There is little wonder therefore, that we continue to get headlines as in today's Independent that suggest a record number of files were withheld from release to the National Archives, raising concerns about the Government's approach to transparency. The papers should have gone to the National Archives in Kew, south-west London, and been made available for public inspection under the so-called 30-year rule, but officials can request that files stay secret if publication would undermine foreign relations, defence or security. According to the newspaper, the documents included 40 connected to India, including files on UK defence sales and the Indian national security guard. A further 15 relate to Saudi Arabia, including one on the "sale of Tornado and Hawk aircraft" and "training for Saudi Arabian special forces". Some 27 papers relating to a visit to the Middle East by the Prince of Wales and Diana, Princess of Wales in 1986 were also retained by the Government. The 986 retention applications were an increase of 4% on 2015-16 and more than 25% higher than 2014-15. The Advisory Council on National Records and Archives said that there was a "noticeable trend" that departments would withdraw their applications when challenged, which happened 22 times compared with four in the previous year, suggesting officials "had not given enough thought to the request". "It is in everyone's best interest to know what their Government is doing," he said. Too right. Is May putting party before country? It has been obvious to many of us for some time that we are in this Brexit-inspired mess because first David Cameron and then Theresa May, chose to put the interests of the Conservative Party ahead of those of the UK. He added that although there had been some progress, there was an “absence of realism”. If, as is looking increasingly likely, the outcome of Brexit talks turn out to be disastrous for the UK, the Tories reputation for economic competence will be destroyed for generations. Politically and economically it will make Black Wednesday look like a walk in the park. Are we heading for post-Brexit customs chaos? With the current chaos surrounding the Government's approach to Brexit negotiations it would be hardly surprising if it all ends badly. Not only are the lies and false promises put out during the referendum campaign coming back to haunt Ministers with a vengeance, but it is becoming clear that those who called this referendum in the first place had no idea what to do with it if the result went against them. The report, authored by Oxera’s head of transport and entitled, Brexit: The implications for UK Ports, suggested huge lorry parks would have to be built in south-east England to cope while longer motorway queues would be an inevitable consequence of greater customs control. “We estimate the impact of such a scenario to be at least £1bn per year. This is an extremely conservative estimate – it does not account for the economic costs of the uncertainty involved, the extra staff needed (for hauliers, ports and customs officials), the congestion associated with calling Operation Stack [which would see the M20 used as a makeshift lorry park], the land required for the additional customs checks [in the form of lorry parks], or of the wider economic impacts of jobs moving overseas due to uncertainty over the operation of just-in-time logistics," it said. Theresa May has promised to maintain the “frictionless” transport of goods between the UK and the EU despite her plan to leave the Customs Union, although she has more recently amended this pledge to “as frictionless as possible”. However, the EU’s chief Brexit negotiator, Michel Barnier, has warned the UK’s hopes of securing “frictionless” trade are unrealistic. He has warned that it is not possible to leave the customs union and build frictionless trade. We cannot leave the single market and keep all of the benefits. UK goods trade with the EU is valued at £466bn. The scary thing is that our dysfunctional government is sleep-walking into this scenario, whilst the main opposition party continues to squabble amongst themselves as to their own approach to Brexit.